Home / Sports / Official: UEFA opens procedure against Ronaldo, for celebrating with "balls"
Official: UEFA opens procedure against Ronaldo, for celebrating with "balls"
UEFA has opened a disciplinary procedure against Cristiano Ronaldo for his celebratory triumph over Atletico Madrid in 1/8 of the Champions League final. The 34-year-old spent his team in the quarterfinals with a super-trick on the return trip to Turin, overthrowing Altetico's victory in the first leg 2: 0,l. 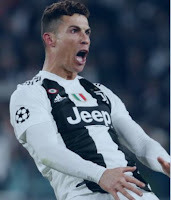 Ronaldo celebrated one of his three goals by imitating the celebration of Diego Simeone by opening the "balls" in the first match, for which the Argentine was fined 17,000 pounds. Ronaldo is accused of misconduct. The UEFA Body for Ethics and Discipline will deal with this case on March 21st.